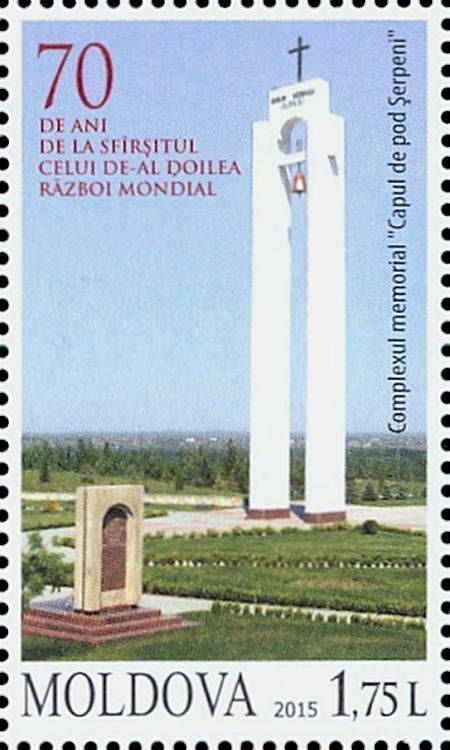 On 5 May 2015, the Post Office of Moldova (Poșta Moldovei) issued a postage stamp with the title 70 Years Since the End of the Second World War. The issue comprises one stamp, with an associated cancellation (postmark) and first day cover (FDC). The designer was Alexandru Kornienco. The printing was performed by Nova Imprim, Chişinău. World War II (WWII or WW2), also known as the Second World War (after the recent Great War), was a global war that lasted from 1939 to 1945, though related conflicts began earlier. It involved the vast majority of the world's nations—including all of the great powers—eventually forming two opposing military alliances: the Allies and the Axis. It was the most widespread war in history, and directly involved more than 100 million people from over 30 countries. In a state of 'total war', the major participants threw their entire economic, industrial, and scientific capabilities behind the war effort, erasing the distinction between civilian and military resources. Marked by mass deaths of civilians, including the Holocaust (during which approximately 11 million people were killed) and the strategic bombing of industrial and population centres (during which approximately one million people were killed, including the use of two nuclear weapons in combat), it resulted in an estimated 50 million to 85 million fatalities. These made World War II the deadliest conflict in human history. Read more.. This article uses material from the Wikipedia article 'World_War_II', which is released under the Creative Commons Attribution-Share-Alike License 3.0.